Nutraceuticals World is a B2B brand intended for individuals with broad-based interests in dietary supplement, functional food and nutritional beverage industries. The brand content and editorial scope of the publication includes industry news and research, new products, people in the industry and more. Contract Pharma is a B2B brand intended for individuals with broad-based interests in the pharmaceuticals and bio-pharmaceutical industry. The brand content and editorial scope of the publications includes well-researched, staff-written feature articles, insightful accounts from industry leaders, new products, industry news and more. Medical Product Outsourcing is a B2B brand intended for individuals with broad-based interests in the medical device outsource manufacturing industry. The brand content and editorial scope of the publication includes comprehensive feature articles, industry news, trends and other developments pertinent to the contract manufacturer-OEM relationship. Recent comScore report examines the effectiveness of ads served on publisher sites versus non-publishers. According to research from comScore, digital ads on publishers' websites receive more attention from readers and have a bigger impact on brand lift than ads on non-publisher sites. Earlier this month, comScore released the results of a survey that measured the impact of several ad campaigns that were served across Digital Content Next (DCN) – an association for digital publishers – member sites and non-publisher sites. 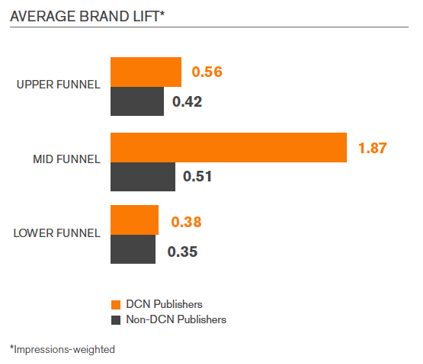 Across every metric of ad effectiveness – ad viewability, brand lift and valid traffic – DCN publishers outperformed the non-DCN sites. And in some areas, the results weren't even close. This is big news for publishers, who are facing downward pricing pressures from programmatic ads and greater competition from non-publisher sites like Facebook. Given the results of comScore's research, publishers can stand by the effectiveness of ads displayed on their sites and can justify charging higher CPMs. These statistics were gathered by comScore from brand lift surveys it conducted for 15 display and video ad campaigns. The campaigns were served on both DCN and non-DCN sites. Twenty-eight of the 75 members in the DCN were included in the survey. One of the key metrics comScore measured was brand lift. 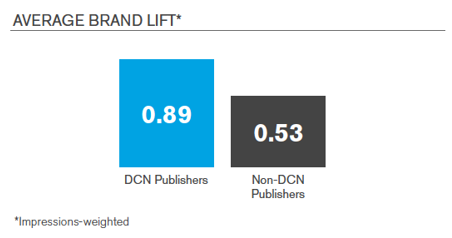 DCN sites outperformed non-DCN sites by 67%, averaging a brand lift of 0.89 versus non-DCN sites' 0.53. Brand lift was further broken down by measuring how consumers recognized the brand at different stages of the marketing funnel. The funnel was divided into an upper funnel (brand awareness and recall of brand messaging), middle funnel (considering a brand's product/solution and intend to recommend that brand) and lower funnel (intend to purchase). Publisher sites outperformed non-publisher sites at every stage in the funnel. In particular, publishers were three times more effective in the middle funnel. "These data suggest that premium publishers may do a particularly effective job at moving the needle at this key phase of the marketing funnel," reports comScore. The middle funnel is a crucial juncture in the consumer journey where consumers are making a decision whether or not to purchase a product or solution. The power of publishers' trusted brands can have a significant impact on this decision, and publishers must communicate that value to their advertisers. The report also revealed that ads on publishers' websites have greater viewability than ads on non-publishers' sites. On average, publishers' ad viewability rate was 50%, compared to the non-publishers' average of 45%. Several reasons could contribute to publishers' better viewability, including their lower rates of invalid traffic (2.2% invalid traffic compared to non-publishers' 3.5%), more time spent on site and greater effort on the part of publishers to optimize their sites for viewability. But publishers' value is not derived from viewability alone. According to comScore, publishers also have what it calls the "Halo Effect." That is, ads that are surrounded by valuable content are more effective at driving consumer actions. By factoring out viewability from the overall ad effectiveness, comScore was able to measure the Halo Effect. It reports that publishers drive 51% higher ad effectiveness due to the value of their content. This is a major differentiator from non-publisher brands that publishers must emphasize when selling their inventory. Other sites might drive more traffic and capture more eyeballs, but publishers are delivering value and engagement that, according to comScore, non-publishers simply cannot match. According to the inaugural HubCiti Publishers' Confidence & Technology Report, the overall confidence in the sustainability of the local and regional newspaper industry has remained virtually unchanged from last year. However, 33% of publishers believe that the industry is getting better, likely based on new technologies, new ways of thinking about their business model, and the new sources of revenue available with digital and social products and services. Consumers of news also responded that they are more likely to view news on a mobile app or website than print, providing additional opportunities for publishers to better target readers with the advanced digital services now available. "The main benefit that newspaper content provides is its high level of journalistic integrity, credibility and quality," said Gregory J. Osberg, CEO and founder of Revlyst. "News consumers are tired of clickbait stories, seeking more locally-focused stories that they can act on in their communities. Only the papers have the resources and editorial knowledge to provide that level of local content." A hefty 87% of publisher respondents rank print ads and classifieds as very important to revenue generation. Respondents ranked subscriptions and website as second and third, with 74% and 64%, respectively, stating they are very important to revenue generation. Respondents ranked video as the least important to revenue, with 60% stating it was not important. Among publisher revenue-generation strategies, the greatest increase in anticipated revenue generation comes from mobile apps, says the report, with a 14% increase over the next 12 months, beating out print ads, subscriptions, websites, events and video. A total of 63% of respondents stated that they believe that implementing new digital services will help generate additional revenue, but only 43% have plans to implement in the next six months. Publishers stated that they plan to see a 50% increase in revenue from both website and mobile app activity in the next 12 months, while 39% of publishers plan to hire new employees for digital service implementations, with 54% planning to also hire a third-party firm. 41% of respondents stated that they prefer a digital version of print content compared to 26% that said they like to search for specific content, with nearly 60% stating that they would not want content suggested for them. Only 8% of respondents stated that they had a high tolerance for watching an ad in order to read an article or watch a video, compared to 28% that would not watch an ad at all. Likewise, 60% said they would not pay for special digital content. Consumer respondents chose traffic and weather updates as the top option with 46% and restaurant specials second with 15% when asked what kind of content besides news they'd like delivered to them. 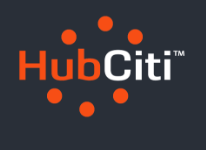 "Publishers know they need to implement advanced digital services," said Roy Truitt, CEO of HubCiti. "Within the next six to twelve months, every newspaper will need to ramp up mobile and digital to meet market and consumer expectations – to redefine themselves as the source of hyperlocal information of all kinds, not just news." Note: This online survey is not based on a probability sample and therefore no estimate of theoretical sampling error can be calculated. Website Analytics via a third-party vendor (Google Analytics, Ominture, etc.) are reported separately within audit reports. The website must carry the same name as the audited masthead to be included in the audit report. Publishers must provide auditors with access to website analytics directly (username and password). Screenshots of data submitted by the publisher are not acceptable. Standard website data included on the report includes: unique visitors (users), pageviews, new vs. returning visitors and geographic data. Data used specifically for marketing campaigns will be excluded from verification reports. Average visitors/users are calculated by dividing the total for the audit period by the number of months within the audit period. Website data is unaudited. If you have questions about website analysis, please contact Verified at 415-461-6006.